The new Ara Pacis Museum in Rome opened in the spring of 2006. The museum was designed by the international architect Richard Meier and has been subject to much controversy and criticism. 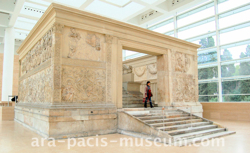 The Ara Pacis, a more than 2,000 year old "Altar of Peace" that was used (paradoxically) for sacrifices, is a commanding work of Roman art and architecture that had been lost to civilization for centuries. Admission: Full price € 6.50 Reductions € 4.50 More details here.